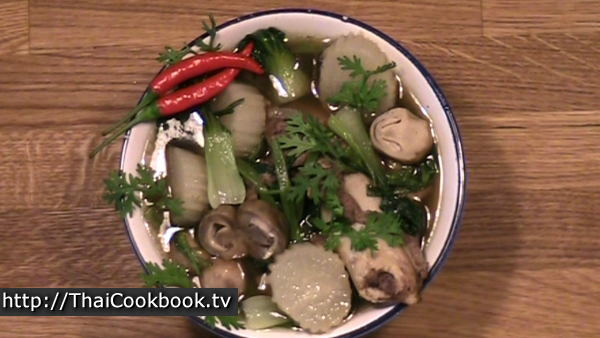 This simple, but very flavorful soup is yet another example of the influence of Chinese foods on the cuisine of Thailand. This version of Tom Jab Chai is made by boiling pork leg bone in a rich broth seasoned with garlic, coriander root, and black pepper. To the soup we add the large white winter radish known as Daikon, some straw mushrooms, flavorful dark green pak choy (Chinese cabbage) and pak boong (river morning glory). 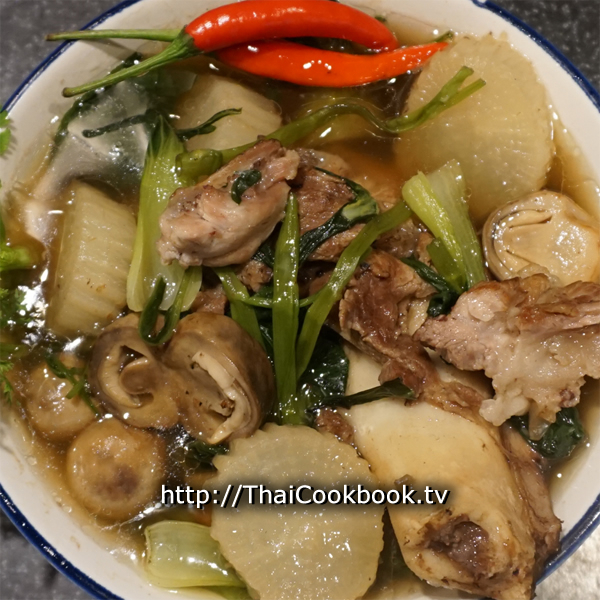 In Isaan, soups of this type are often eaten with sticky rice, with the broth serving as a sort of dipping sauce for the rice, but we generally serve it here with a small plate of steamed Jasmine rice. The soup is spooned over the rice and eaten. However, this soup is so thick and hearty that you really won't need eat it with anything but a spoon. What's in our Pork Bone Soup with Daikon and Cabbage. 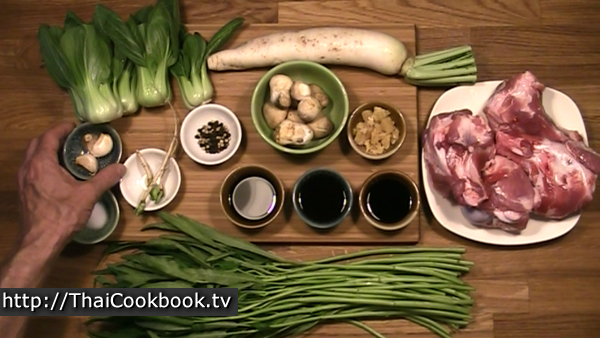 How we make our Pork Bone Soup with Daikon and Cabbage. 1) Grind peppercorns, garlic, and coriander root until they make a rough paste. 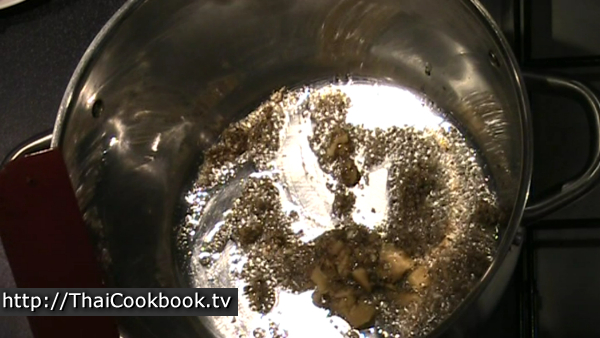 Add oil to a big soup pot, then stir in the herb paste until it is lightly browned. Add sugar and fry until it melts. 2) Fry the bones in the oily herb paste until lightly browned on all sides, then add soup stock to the pot. Cook for 1 hour. 3) Add sliced daikon and mushrooms. Cook for 30 minutes. 4) Add bok choy and pak boong. Cook for 15 minutes. 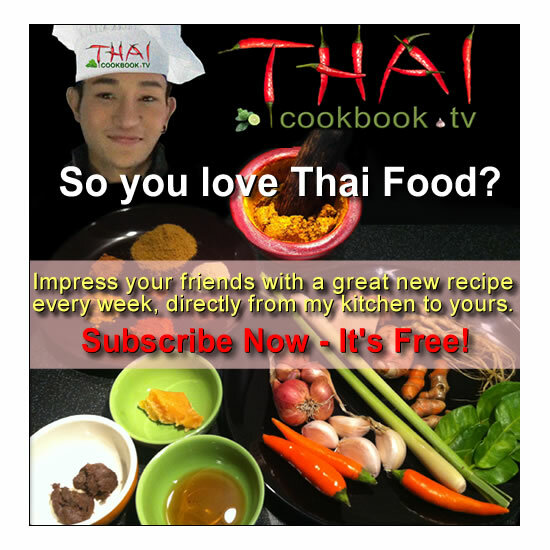 Serve with hot steamed rice or sticky rice. This is a big, hearty soup that is intended to be a whole meal when served with rice. Choose one nice big pork soup bone with a lot of meat for each person. Clean and cut the coriander root into very small pieces. Peel the garlic gloves. 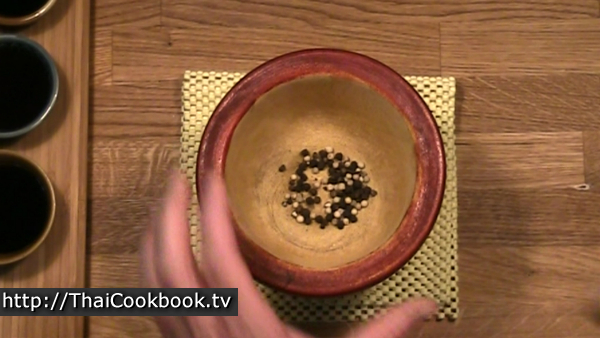 Grind the peppercorns using a mortar and pestle until they are roughly chopped, then add the coriander root and garlic. Grind the herbs together until you have a rough paste. 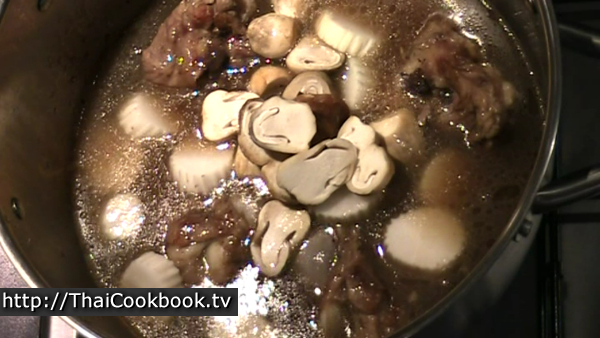 Add 1 Tablespoon of oil to a soup pot big enough to lay all the bones out flat. Stir in the herb paste and fry it until it is slightly browned. Next add the sugar and stir it in until it melts. Add the bones to the pot and fry them on all sides in the herb and oil paste. After they are well browned, add the soup stock. Season with soy sauce, fish sauce, and oyster sauce. 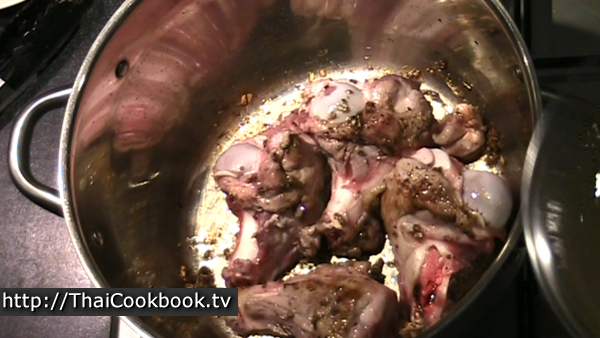 Bring to a boil, then cover and cook for about 30 minutes, then turn the bones over and cook for 30 minutes more. 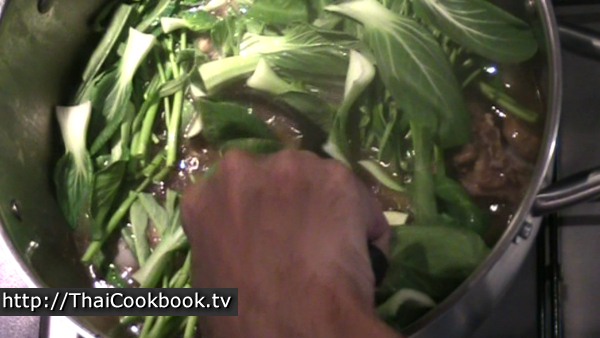 While the bones are cooking, cut the ends off the bok choy, and cut the pak boong into 4 inch long pieces. Peel the daikon, and cut it into 1/2 inch slices. Slice the mushrooms in half. After cooking for a total of 1 hour, add more water to top it off at the level of the bones. Next add the daikon and mushrooms to the pot, stir in well, and continue boiling for 30 more minutes. Next add the bok choy and pak boong. Cover and cook for about 15 more minutes. Serve each serving in an individual bowl with one bone and lots of vegetable. Cover with broth. Garnish with cilantro and Thai hot chilies. 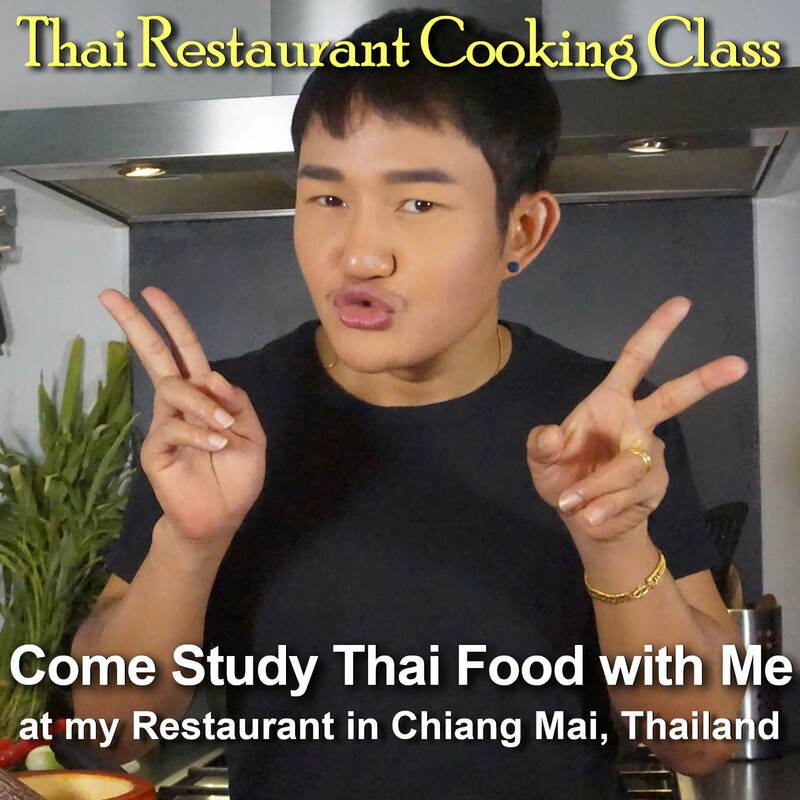 Serve with hot Jasmine rice or sticky rice on the side.